Defiant Thai protesters today stormed the army headquarters, asking the military to back their six-day-old campaign aimed at toppling Prime Minister Yingluck Shinawatra even as she ruled out early elections. Angry workers today set fire to one of Bangladesh’s largest garment factories, destroying the nine-storey building, following rumours that two of their colleagues had been killed in a clash with the police. China’s new air defence zone, stretching far into East Asia’s international skies, is an historic challenge to the United States, which has dominated the region for decades. For years, Chinese naval officers have told their US counterparts they are uncomfortable with America’s presence in the western Pacific, and Beijing is now confronting strategic assumptions that have governed the region since World War Two. Career infantry officer General Raheel Sharif, considered to be a moderate and an old India hand, today took over the command of the 600,000-strong Pakistan army from General Ashfaq Parvez Kayani. Over 1,500 protesters entered the compound and submitted a letter addressed to the army chief, asking military leaders to “take a stand” in Thailand’s spiralling political crisis. More protesters besieged the ruling Pheu Thai party’s headquarters as part of efforts to force Yingluck to step down, shouting “Get out, get out”. The demonstrators left both the places after a few hours. Security was tightened around the party’s headquarters. Ruling out a fresh poll, Yingluck told BBC she was not sure the protesters would be satisfied even if she called an election. “I love this country. I devote myself to this country. I need only one thing for the country: we need to protect democracy,” she said. She said the situation in Thailand was “very sensitive” and repeated her call for negotiations to resolve the crisis. For the past week, thousands of anti-government protesters have marched in Bangkok in a bid to unseat Yingluck, whom they accuse of serving as a proxy for her fugitive brother and former premier Thaksin Shinwatra. The demonstrations have raised fears of fresh political turmoil and instability in Thailand and pose the biggest threat to Yingluck’s regime since she came to power in 2011. Amid the growing unrest, Yingluck said she would not authorise the use of force against protesters occupying government buildings. Meanwhile, former premier and opposition leader Abhisit Vejjajiva said he would lead the protesters if rally leader Suthep Thaugsuban is arrested. He said Thaugsuban has raised public awareness about doing the right thing for Thailand and this wouldn’t change even if he was no longer able to lead the protests. Attorney-General Atthapol Yaisawang has appointed a committee to consider a petition seeking an order from the Constitutional Court to stop the ongoing protests. 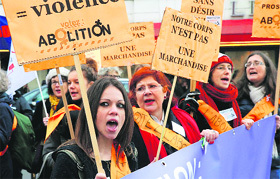 The petition alleged that the protests violated the Constitution. Yesterday, Yingluck asked demonstrators to end the street protests after surviving a no-confidence vote in Parliament. The no-confidence motion was filed by the Opposition, which alleged widespread corruption in the government. In a televised address, Yingluck said the protesters should negotiate with the government. But protest leader Thaugsuban rejected her appeal. Demonstrators have been surrounding and briefly occupying official buildings in an attempt to disrupt the government. On Monday, protesters in Bangkok stormed the Finance Ministry and converted it into a “command center”. An estimated 100,000 opposition supporters protested in the capital on Sunday, though the numbers appear to have dropped significantly during the week. Fire broke out at two Standard Group buildings in the industrial district of Gazipur outside the capital Dhaka at around midnight following clashes between workers and members of the management. The police rushed to the spot and fired rubber bullet and teargas shells to disperse the workers, triggering a clash, said Shawkat Kabir, inspector of the Gazipur industrial police. 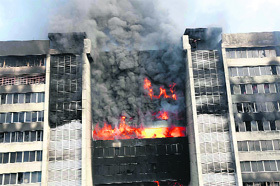 No casualties were reported due to the fire as it was closed at the time. Twelve fire-tenders from seven stations brought the fire under control after 12 hours, said Aktaruzzaman Liton, deputy assistant director of Gazipur Fire Service. China’s recent maritime muscle-flexing in disputes over the Paracel islands and Scarborough Shoal in the South China Sea and over Japanese-administered islands in the East China Sea has stirred concern and extensive backroom diplomacy in Washington. But it took the events of the last week to spark an immediate and symbolic response from the United States - the unannounced appearance in the zone of two unarmed B-52 bombers from the fortified island of Guam, the closest US territory to the Chinese coast. China’s unilateral creation of the zone, accompanied by warnings that it would take “defensive emergency measures” against aircraft that didn’t identify themselves, has raised the stakes in a territorial dispute with Japan over tiny, uninhabited islands in the area. Even as some suggest Beijing’s move is already backfiring, experts in China say it is a part of a long-term effort, carrying broader historic significance for the United States as the traditional provider of Japanese security. The regional tensions will loom large when US Vice-President Joe Biden travels to Japan, China and South Korea early next week. Shi Yinhong, a professor of international relations at Renmin University who advises Beijing’s State Council, said Washington had recognised China as a great trade and diplomatic power, and should now acknowledge China needs its own “strategic space”. Japan and South Korea, another treaty ally of the US, also sent military aircraft through the zone this week without informing China, lending muscle to earlier diplomatic protests. For all the apparent boldness of China’s move, some regional analysts believe Beijing has over-reached, in comparison to earlier campaigns of assertion. General Kayani, the longest serving army chief under a civilian government, passed the baton of command to 57-year-old General Sharif at an impressive ceremony held at the General Headquarters (GHQ) in Rawalpindi. 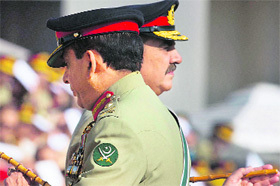 General Sharif was chosen by Prime Minister Nawaz Sharif as the 15th chief of the Pakistan Army on Wednesday.